Since the debut of Batman on screen in 1943, the Caped Crusader has gone through transformation after transformation, costume change after costume change, some more subtle than others. When looked at in their entire scope, the changes over the years have essentially made the Batman a new person altogether. From the Batsuit’s days of thin spandex-like material, more akin to a professional wrestler than a superhero, to his current suit made from hardened kevlar plates on titanium-dipped tri-weave fibers, making Batman’s body practically impenetrable (other than by Rachel Dawes, rest her soul). 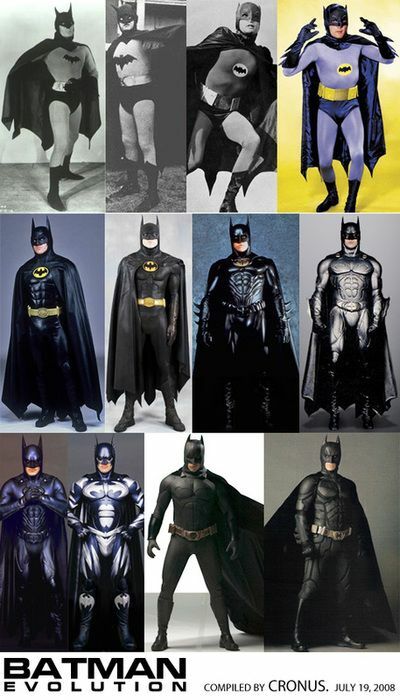 I like the batsuits from Batman (1966-1968), Batman (1989), Batman Returns (1992), Batman Forever (1995) and Batman & Robin (1997) but not the ones from the 1940s chapter plays, 2005’s Batman Begins or 2008’s The Dark Knight.